King James Only? Is the King James Version the Only Inspired English Bible? Is the King James only doctrine correct? Is the King James Version the only inspired English Bible? 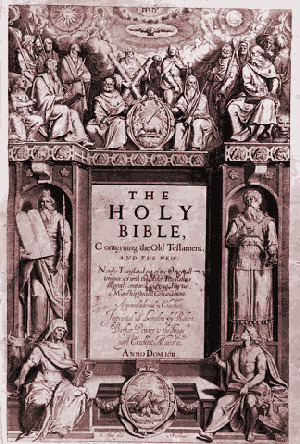 The King James version of the Bible was translated in 1611 by three teams of translators. King James of England authorized this translation, but he did not translate it himself. The Bible says that not one jot or tittle will pass from the Law until it is all fulfilled (Matt. 5:18). Modern versions violate this by making changes from the KJV. These changes are not just in the translation but also in the Greek texts from which their New Testament is translated. King James only literature says that the NASB and NIV, the two most popular modern translations 20 years ago, make some 5,000 changes in the Greek text of the New Testament, often leaving out important words and phrases. For example, the King James Version says in Colossians 1:14 that we have redemption "through his blood." Modern translations, following an updated Greek text, usually leave out "through his blood." Are we losing the Gospel in these modern versions? It is true that most modern versions leave out "through his blood" in Colossians 1:14. However, Ephesians 1:7, which says exactly the same thing, has "through his blood" in both the modern versions and in the KJV. If this is some sort of conspiracy, it's not a very good one. The fact is, modern translations are just trying to recreate the most accurate Greek text. There is no conspiracy, and you cannot teach any different doctrines out of the New American Standard than you can out of the King James Version. Another notable passage is 1 John 5:7, which is not even found in most modern translations. All Bibles say that there are three that bear witness: The Spirit, the water, and the blood. The KJV, however, following the 3rd edition of the Textus Receptus, adds that there are three that bear witness in heaven: the Father, the Word, and the Holy Spirit. King James only advocates argue that the omission in the modern versions takes away from the doctrine of the Trinity. Of course, it does not. There are plenty of verses in modern translations that describe all three members of the Trinity in the same verse (e.g., Matt. 28:19 and 2 Cor. 13:14). So What About Matthew 5:18? Matthew 5:18 is a prophecy passage. The word there for "fulfilled" is the Greek genoito, which means "happened." Jesus is saying in Matthew 5:18 that no prophecy of the Law will be forgotten, but all of them will come to pass down to the smallest part or "every jot and tittle." Jesus was not promising that the Greek text of the New Testament would never be in doubt throughout the centuries. He wasn't even commenting on such a thing. Losing the Words of God? What about our confidence in the Word of God? King James only advocates argue that the differences, as well as notes that are usually added to modern versions, create doubt in the Word of God because they indicate that we are not certain about the original wording of certain passages of Scripture. Here is where it is time for us to be honest. There are doubts about the original wording of certain passages of Scripture! This page on 1 John 5:7, which appears to be well researched, says that it's "an overstatement of the evidence" to say that Erasmus promised to include the Comma Johanneum, as it is called, if someone produce a manuscript. They do say that the converse is true. Erasmus did refuse to put it in without Greek manuscript support. I left my description unchanged because those two statements are not that different, and I got my version from a history book as well. 1 John 5:7 is one of the passages where there is NOT doubt about the original wording. The King James version is wrong on this passage, and we know that. The extra passage, saying that there are three that bear witness in heaven, is included in the updated edition of the Latin Vulgate, put out by the Roman Catholic Church around A.D. 800. The original Vulgate, done by Jerome around A.D. 400, did not have it. 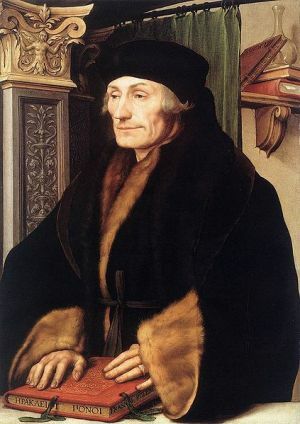 When Erasmus put together the Textus Receptus ("Received Text")in the 16th century, he did not include the part about three bearing witness in heaven because it was not supported by even one Greek manuscript. There were people who were offended by this, and Erasmus told them that if they could produce even one Greek manuscript that contained the disputed passage, he would include it in his 3rd version of the Textus Receptus (but see sidebar). He had already finished versions one and two. Not surprisingly, they came up with a Greek text, which Erasmus was aware was almost certainly a forgery. Erasmus, however, did not like personal conflict, and he included the passage in his 3rd version just as he promised. His conscience got the better of him, though, so when he created the 4th version, he left it out. Unfortunately, the translators of the King James Bible used a text based on Erasmus' 3rd version, not his 4th. Thus, when modern versions leave out 1 John 5:7 they are not taking away from the words of God, they are correcting the Greek text back to the original wording of the apostle John. King James only advocates are right about one thing: there are questionable passages in our Bibles. There are numerous places where the over 5,000 Greek texts of the New Testament disagree with one another. Sometimes it is obvious where the problem lies. A passage is clearly duplicated or a word is left out, and it obvious that this was a copyist's error. In other cases, however, like, for example, Romans 8:1, it is impossible to tell. Some Greek texts have the phrase "who walk not after the flesh but after the Spirit." Is this a case where a copyist looked down at Romans 8:4, saw that phrase, and accidentally added it onto Romans 8:1 as well? We don't know. Therefore, even if a modern translation chooses to leave that phrase out of Romans 8:1, they normally include a note saying that some Greek manuscripts—usually less ancient ones—include the phrase. Sometimes such difficulties can be resolved by examining quotes of the Scriptures in the early Christian writings. We have Christian writings dating back to A.D. 100, or even before, that quote some passages of the New Testament. Sometimes, however, a difficult Greek text can't be found quoted by the early Christians. As a result, there are some passages in our New Testaments where we do not know the original wording of the writer. We can pretend all we want, but facts are facts and history is history. There are simply some passages of the New Testament where we do not know the original wording. Part of the problem we modern Christians have, whether we hold to King James only or not, is that we have made the Bible into something it was never meant to be. Until the 4th century, there were questionable books among the books of the New Testament. Some churches included James, 2 Peter, and 2 and 3 John, and some didn't. Some included Hebrews, and some didn't. Some even included books like The Letter of Barnabas, The Shepherd of Hermas, and First Clement. The early churches lived for 400 years with those kind of doubts, and they did just fine. In fact, they lived significantly better than we do! The Word of God is neither the King James only nor any other Bible only. The Bible, whether read in the KJV or any other version, states clearly that the Word of God is not limited to what is written. Eventually, I will have to do a page on the Word of God as it was understood in the Scriptures and in the early churches, which will thrill you, change your life, and build great confidence in God. For right now, let me just give you this. Jesus Christ is the Word of God, and when he is planted in human hearts, like a seed (Jam. 1:18; 1 Pet. 1:23), he will produce in his followers everything they need to know in order to follow him. That is why the Scriptures tell us—together as we speak the truth in love to one another (Eph. 4:11-16)—that we don't need any man to teach us. The anointing that comes from God will teach us all things (1 Jn. 2:27). This is why Zaccheus knew, as soon as he heard the Word of God from the lips of Jesus, that he must do something about his love of money. He immediately promised to give half his goods to the poor and restore fourfold to everyone that he had cheated (Luke 19:8). That same reason is why Peter knew, after hearing the Word of God from the lips of Jesus, that he was a sinner and that he needed to forsake everything and follow Christ (Luke 5:8,11). Both men had the Word of God planted in their heart like a seed, and it gave them everything that they needed to know, whether they had heard it before or not. This is the trust that the apostles and their churches had in the Word of God, which is the Scriptures, but is far more than the Scriptures as well. Primarily, Jesus Christ is the Word of God (John 1:1; Heb. 4:12-13), and we would fare much better if when we used the phrase "the Word of God," we were referring to him.